That's a bit better, eh? The Galaxy Fit's awkward horizontal screen orientation could put a crank in your neck, so Samsung is readying a fix to this obvious flaw. 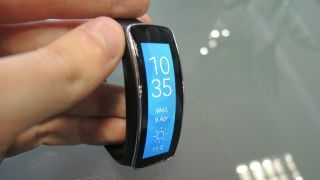 An update to the wrist-worn gadget with an easier-to-read vertical orientation has been spotted in an official Samsung store in South Korea and the company confirmed its existence to TechRadar. It's unclear if the option to rotate the screen 90 degrees is destined for the Samsung Galaxy Fit release date or a post-launch firmware update. The fitness tracker ships globally on April 11, the same day as the Samsung Gear 2 and Gear 2 Neo smartwatches as well as the Galaxy S5 smartphone. The Gear Fit's new, more natural screen orientation may make it easier to check your physical activity, but it still won't be possible to sync that data to non-Samsung devices. The stylish curved Super AMOLED is a "world's first" that remains exclusive to 20 Samsung phones and tablets like the popular Galaxy S4 and phablet-sized Galaxy Note 3. It won't work with other Android devices and certainly won't cater to Apple's iOS platform to the chagrin of some iPhone 5S owners. That leaves the door open to more compatible Android Wear smartwatches and the rumored iWatch, both of which are expected to put a heavy emphasis on health and fitness tracking.